It’s eleven o’clock at night. Do you know where your dog is? If you are anything like the group surveyed by the American Kennel Club, your dog is most likely snuggled into your bed. 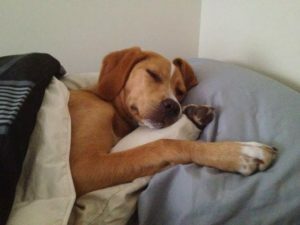 A survey conducted by the AKC found that 45% of people with dogs allow their pup to sleep in their bed. If more than 60 million US households have a dog at home, that’s a lot of fur on the covers! There’s no need to be embarrassed by this sleeping arrangement. Not only is it common, but there are scientific reasons to sleep with your pup. Have you seen therapy dogs walking around the airport? Some US airports like Denver International have a squad of animals roaming the terminals. Why? To help soothe frazzled travelers, of course. Research shows that therapy dogs help reduce anxiety. If dogs can help travelers keep their cool, why couldn’t they help ease tension before you go to bed? Well, your canine pal can absolutely make you feel more at ease at night. 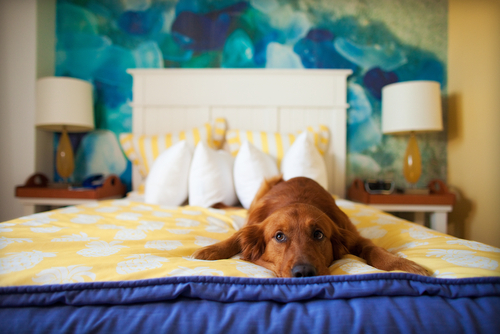 Here are three other reasons science says dogs should sleep in your bed. 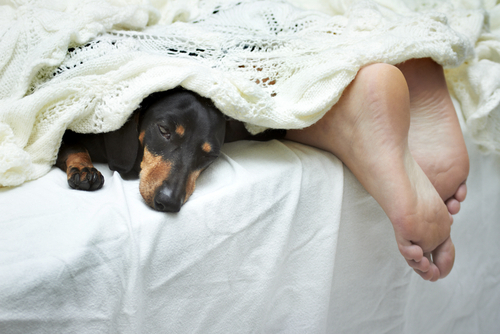 A pooch sharing the covers won’t negatively impact your sleep. There’s a line of thinking that allowing your canine to sleep in your quarters will disrupt your slumber. Those hours of shuteye are extremely valuable, so you wouldn’t want to upset the rhythm of rest. Not to worry. In its study, “The Effect of Dogs on Human Sleep in the Home Sleep Environment,” the Mayo Clinic found that for adults without sleep disorders, sleeping with their dog caused no negative consequences. 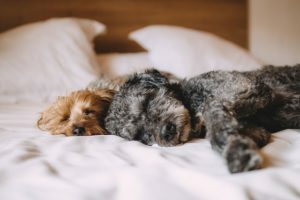 In fact, the research results showed that both the dogs and humans slept together fine, and the size of the dog was not a factor when it came to affecting sleep quality. Make room for your Mastiff or Yorkie. There’s room for both! Reduce Stress. And Your Blood Pressure! Petting a dog reduces blood pressure. You won’t spend all of your sleeping hours petting your dog, but you can lessen some tension by massaging your buddy for a few minutes before heading off to dreamland. A study from the Journal of Behavioral Medicine measured the blood pressure of 60 male and female participants while they either pet a dog or talked to someone else. The research showed that people’s blood pressure was lowest while they pet a dog and highest while talking to someone else. When it’s time to go to sleep, help your biological functions calm down by giving your pooch a few pets. Stressed before bed? Bring your dog onto the mattress. Maybe there’s an exam on the horizon, a deadline at work, or a sick family member to take care of. Whatever the cause, you’re most likely carrying around some levels of stress. Dogs can help. Some research has found that interacting with a dog can decrease cortisol levels and increase oxytocin. Say what? Cortisol is the hormone that causes stress and oxytocin is the hormone that increases trust in humans. Basically, being around your dog can reduce tension and increase pleasant feelings. That same study found that its participants reported feeling less stressed by being around a dog. Science says sleeping with your dog won’t hinder your rest and it will most likely keep you calmer. But wait. There’s more. The X-Factors: Warmth And Security. 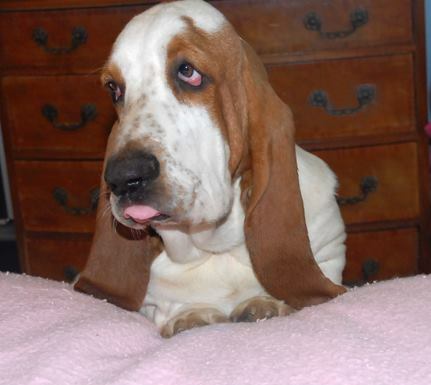 If science and research aren’t your things, there are practical reasons to make room for your pooch on the bed. Here are two. First, warmth. Imagine it feels like -50 degrees Fahrenheit outside. After the recent polar vortex that swept across much of the United States, many people won’t have to imagine the bone-chilling temperatures. They lived it. Back to the scenario: imagine it’s bitterly cold outside and your furnace can only do so much. Allowing your pet to curl up next to you, or stretch along your side will help you conserve heat. So when it’s chilly out there, make like the Emperor Penguins and huddle with your dog. Another reason to catch some Z’s with your canine is peace of mind. Maybe you haven’t installed a home security network or maybe you want the added sense of safety. Keeping your dog close can make you feel safer. If there is a sudden noise, your dog will alert you by startling or barking. You can rely on your canine buddy to let you know if things are amiss in and outside your home. It’s like installing the home security network without the quarterly bill. What’s In It For Your Dog? For humans, a canine companion is a great addition to sleep. But, how about from your dog’s perspective? A study from the journal Human Nature says if you have a well-behaved, happy pup, there is no reason why you shouldn’t let them sleep in your bed. In fact, sharing your space will most likely deepen the bond between you and your beloved pooch. It’s a mutually beneficial scenario. And don’t they look so happy up there on the bed? Melts my heart. The next time someone asks if your dog sleeps in your bed, you can proudly tell them yes. Why? It all comes down to science. Research shows sleeping with your canine counterpart lends itself toward a better night sleep, and you personally know it makes you more comfortable. So be proud, and enjoy a restful night’s sleep…with your furry friend.